Purposefully crafted, this custom-designed home blends elements of old and new style. Nestled in the heart of the historic Benton Park Neighborhood, Jessi and Jamie Hatfield’s one-story rebuild effortlessly exudes the celebrated character of the home’s distinct locale. After taking one look inside, however, it’s obvious that the couple’s custom-designed standout is anything but expected. Tired of noisy, cramped apartment living, the homeowners started their search for a functionally fabulous home in the city but quickly realized that what they desired would have to be built from the ground up. “Anything accessible that we found lacked style, so we knew that the only way to have equal parts of both was to start from scratch,” explains Jessi. 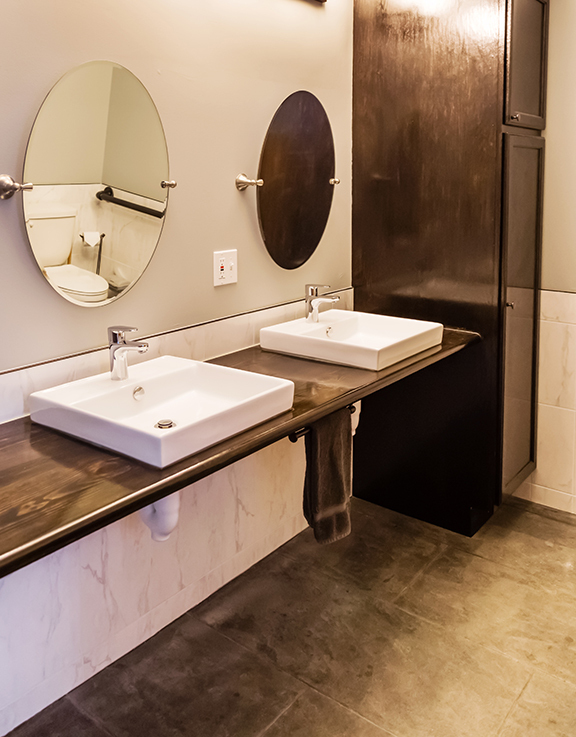 With a clear vision in mind, the pair teamed up with Mike Killeen of Killeen Studio Architects and Scott Vogel of Grand Home Solutions to transform four vacant lots into a stunning space that met their unique needs while still echoing the community’s local legacy. 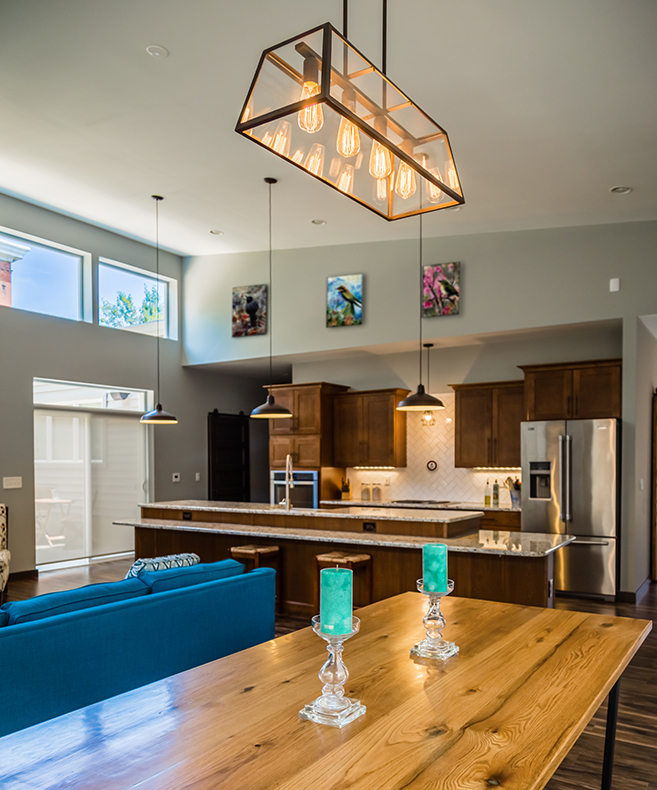 Focused on putting a stylish spin on universal design, a spacious, open concept provides ample room for entertaining and highlights the warehouse-inspired home’s modern architecture and eclectic details. A window-lined, grand sloping roof lets in natural light to brighten the adjoining kitchen and living room, further complementing the cozy, industrial décor. Rustic, pendant light fixtures hover over a large, three-tier granite island, and white subway tiles pop against the weathered wood cabinetry, which is tailored to a convenient custom height. Comfortable furniture and colorful, contemporary accessories adorn the living room, tastefully blending the two spaces. 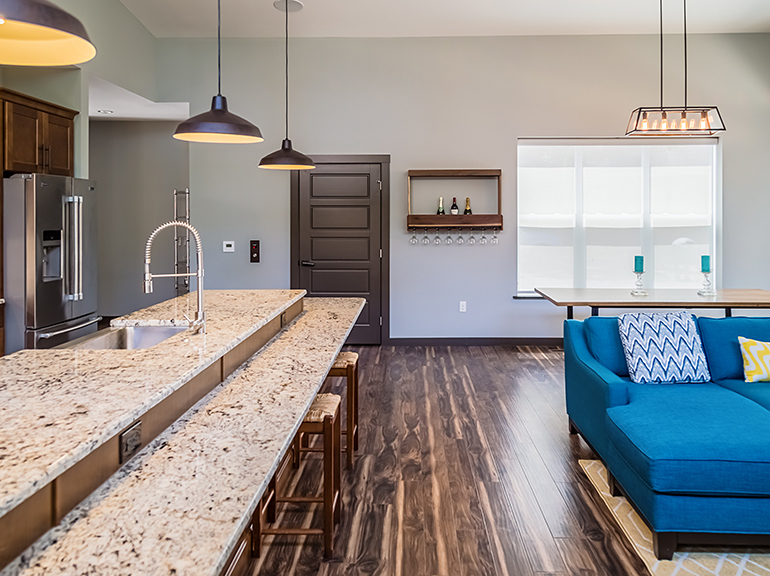 Durable concrete floors, which have been artfully stamped and stained to mimic tile, stand up to wear and tear while making a sophisticated statement in the bedrooms, bathrooms and lower level. A working elevator leads to a basement hang out for Jamie, while zero-step entryways and an attached garage make it just as simple to enter the trendy abode. 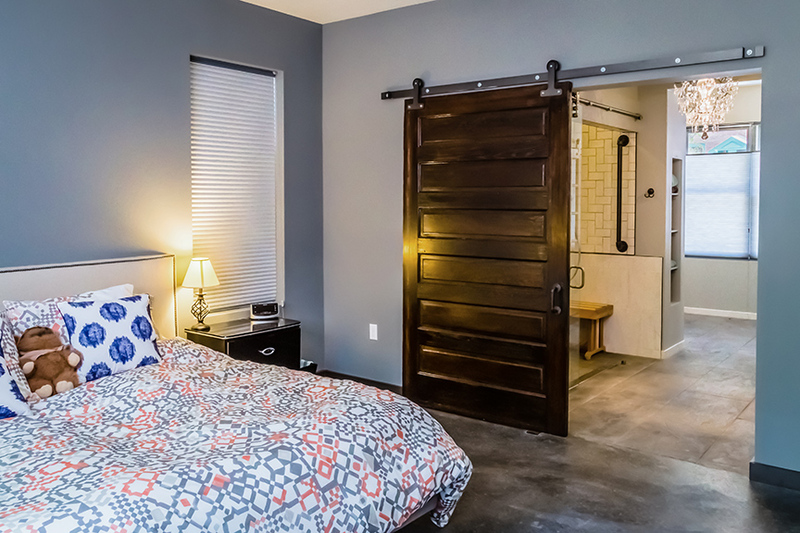 Antique, sliding barn doors are perfectly hung in every widened doorway, another key component of the accessible plan. 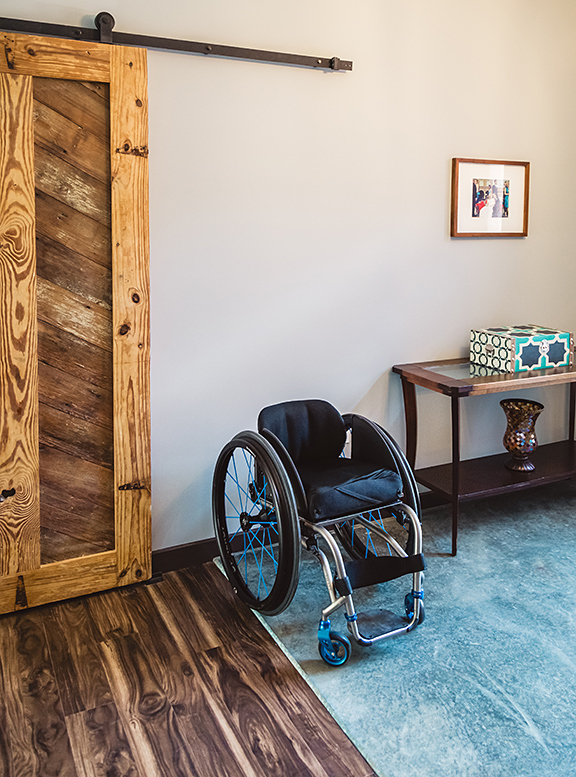 “Everything in our home needed to be functional, but we didn’t want it to scream universal design,” says Jessi. The master suite is complete with a massive walk-in closet, glittering chandelier and dark-wood vanity made from a floating stair tread. 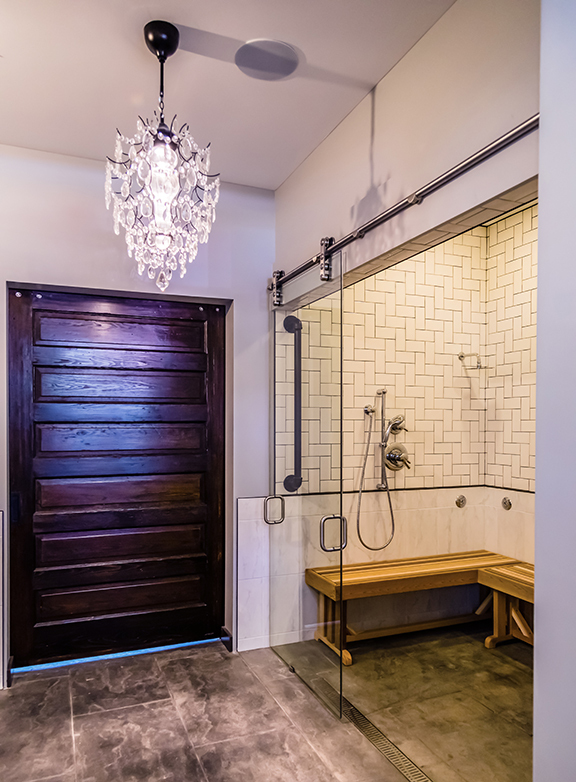 The roll-in shower, ornamented with tile placed in a fashionable herringbone pattern, becomes a focal point while serving an important purpose. 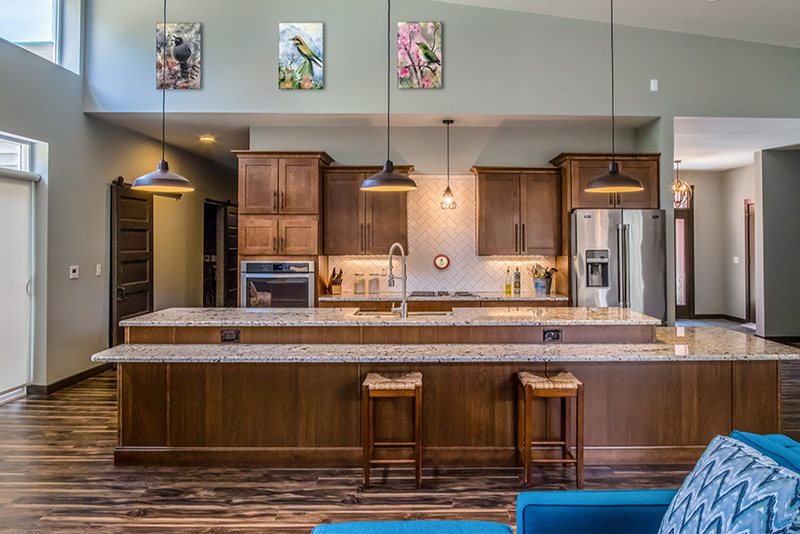 “There was no reference point or guidebook for creating something so personalized, but we built a home that fits in with the area on the outside and fits perfectly with the homeowners on the inside,” says Mike. Not short on practicality or panache, Jessi and Jamie’s dream home is much more than what you see from the outside looking in.